red sleeping beauty is a thoughtful quartet which sings to youth and those who try to understand modern youth. dark-haired niklas angergård and mikael matsson and blond kristina borg and carl-johan näsström are creative, young artists who enjoy entertaining. all are attending collage to round out their education. they write their own songs, commenting upon our time, dealing with many subjects reflecting the feeling of youth in our society. their music represents a whimsical mixture of pop, folk, jazz and classical melodies. they look at themselves as "impressionists" in their approach to their artform which mirrors the thoughts and problems of their generation. they play the guitars skilfully with an exciting, new sound. their voices blend well, using intricate harmonies and individual solo passages. with their integrity of real artists they are watching the production of their works closely. in young producer mike innes they found a sensitive and dedicated executive. "he really understands us and our ideas...", to quote their own words. the twenty year old boys and girl were born a few days apart in different cities and are from different backgrounds. mikael matsson and niklas angergård, the philosophical and impetuous two of the quartet, has already ten years of experience as successful actors on the stage, in films and tv. they enjoy talking to people, especially young girls; art and travel are their hobbies and they are partial to three toad tree sloths. 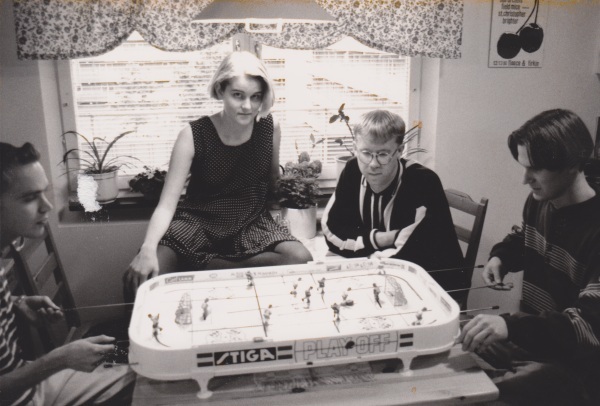 kristina borg and carl-johan näsström, the serious and thoughtful ones, grew up in a pleasant sedate home. only through meeting the others did they turn to the artistic field. they are quiet; likes to listen to people, especially young boys and girls and they don't talk too much. but when they say something, it is a valuable and interesting comment. their great loves are sport cars, cats and oranges which they can eat any time and any place. the future holds great promise for them. niklas and kristina would like to become better composers and musicians. mikael wants to continue playing and writing exciting music. carl-johan has another aspiration to be a good film director and writer. - can you say love will last? - how do you kill your heart?